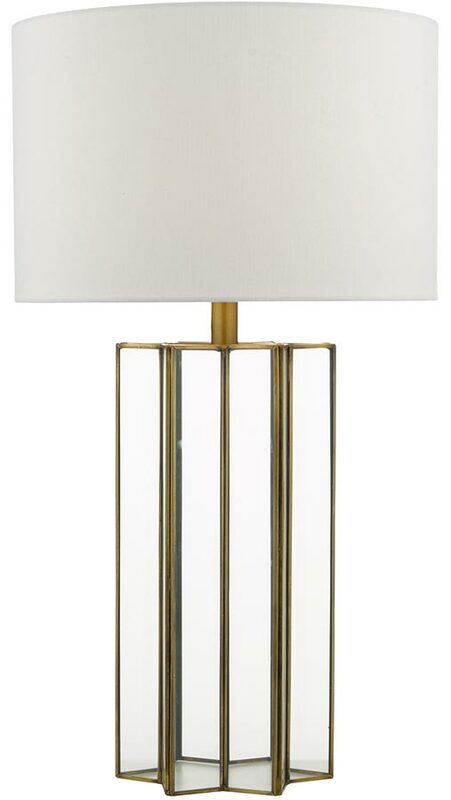 This Dar Osuna brass framed glass table lamp with shade is contemporary and boasts a handmade sectional glass base. The star shaped base is hand crafted from a brass frame, inset with glass panels carefully soldered by hand to create a solid structure. The brass has been treated to give it an aged appearance which contrasts beautifully with the supplied 14″ natural linen drum lamp shade. This beautiful design will complement a wide range of styles and will instantly update any room in which it is displayed. Fitted with twisted braided cable, an inline rocker switch and class 2 double insulated, no earth required. Dar lighting is widely recognised as one of the leading suppliers of a full range of innovative, quality lighting products such as the Dar Osuna brass framed glass table lamp with shade you see here.